It’s that time of year when we may be thinking of which project to take on holiday with us – how do you choose? For me it has to be something small & easy to carry in my shoulder bag, so I can have it with me all the time – you never know when a crafty opportunity may become available! For portability & ease of picking up & putting down, I always used to choose a crochet project. However a worn thumb joint is directing me more to knitting currently, so I’m thinking of playing with a design for a new shawl/scarf pattern instead. 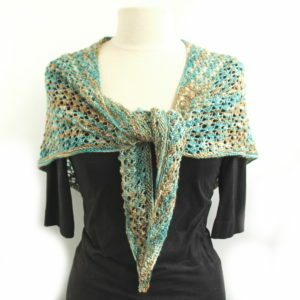 I recently came across this Shawl Design for Everyone article & now I’m bursting with ideas to try out on my weekend break. Watch this space to see what I come up with!